Origin and Habitat: Harrisia martinii is restricted to the Chaco, an extensive sedimentary basin from the sub-Andean hills in the north-west of Argentina (provinces of Chaco, Entre Ríos, Formosa and Santa Fe) to the Parana-Paraguay rivers in north-eastern Argentina and Paraguay (Central, Concepción, Cordillera, Paraguarí, and Presidente Hayes departments of Paraguay). It is also found in Uruguay between Bella Unión and Paysandú, and in southern Bolivia. Altitude range: It occurs at elevations between 10 and 500 metres above sea level. Habitat and Ecology: The species occurs in hilly areas among shrubs, and in forests and forest clearings. Natural vegetation is tropical deciduous forest in the east, gradually becoming xerophytic thorn-woodlands towards the west Near the Paraguay River, seasonally flooded open savanna is interspersed with islands of palms and forest. In good soil under trees H. martinii forms dense tangled mats on the ground and clambers 2-3 m up supporting vegetation. It prefers deep clay soils and thrives in summer rainfall areas receiving 500-1300 mm annual rainfall In South America. Harrisia martinii is shade-tolerant but will also grow in the open. It is favoured by anthropogenic activities. It is widely distributed, is abundant throughout its range, and there are no major threats affecting it. It occurs in several protected areas. 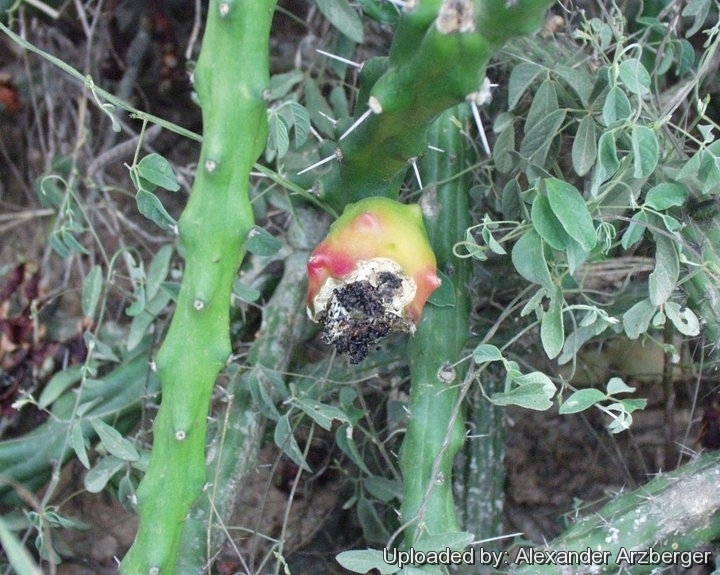 Harrisia cactus, together with many related cactus species, is a minor component of the under-storey. Harrisia martinii was introduced into Australia as an ornamental about 1900 , and rapidly became a problem in Queensland from Bowen and Rockhampton. In suitable conditions, it outcompetes native groundcover plants to form dense impenetrable thickets with up to 140 000 plants ha' and 80-90% groundcover. It continues to spread into new areas and remains a major problem in grazing land, under shade belts and in rocky country. It has became a noxious weed in South Africa too. Two insects have been introduced from South America to control H. martinii These are a mealybug Hypogeococcus festerianus, and a cerambycid Alcidion cereicola and satisfactory control was achieved several years later. 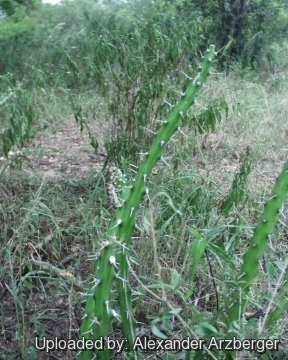 Description: Harrisia martinii or Moonlight Cactus is a slender clambering perennial cactus with long much-branched succulent stems 20-50 mm thick, which have five to six longitudinal ribs bearing spines in areoles, each creole with several short flat spines and one to three sharp spines up to 2 m or more metres long. It puts forth many basal shoots, which root where they touch the ground and can form a tangled, impenetrable mass. The large, white funnel-shaped flowers develop in the summer after rain and are up to 20 cm long and very showy. Each flower opens for a single night. Fruit are roughly spherical, spiny, red and 35-50 mm diameter when ripe. Stems: Green to grey-green, fleshy, jointed, 2-2.5(-50) cm in diameter; old stems terete, round in cross section, spineless, young stems vigorous pointed. Ribs: Longitudinal 4- or 5(-6)-angled with triangular humps at regular intervals. Roots: The root system is fibrous and shallow, with extensive deeper tuberous storage roots developing from the crown in larger plants. Areoles: With grey, felty hairs. Central spines: 1(-3), stout, much longer than radial spines, erect, spreading, straw-yellow with dark tip, 2-3 cm long. Radial spines: 5-7, short, sometimes half as long as the central lying flat. Flowers: Nocturnal, arising singly within areoles near stem tips, white with a pink tinge, funnel-shaped/tubular, to 15-20 cm long; Outer perianth-segments narrow, becoming pinkish, acuminate. Inner perianth-segments broader, short-acuminate, white or tinged with pink. Style green. Pericarpels tuberculate with scales and brown wool. Blooming season: Mainly spring and summer. Harrisia martinii has an extraordinary number of blooms which open over a series of days. But even then each individual flower is open only for one evening. Night-bloomers generally open well into the evening, beginning any time after sundown and continuing through the night. Rowers start to fade as soon as the sun comes up, but will remain open and fresh for as long as the sun does not strike them. By mid-morning all from the previous night are spent and the process of developing seed and fruit has begun. Fruits: Red, 3.5-4(-5) cm long, not tuberculate or with small conical bumps with red scales surmounted by cushions of hairs and spines (sometimes without spines), and with up to 1000 small black seeds embedded in a sweetish, crisp white pulp; when ripe, split along one side the flowers withering-persistent. The fruits are attractive to birds. 2) Oakley, L., Duarte, W. & Pin, A. 2013. Harrisia martinii. The IUCN Red List of Threatened Species 2013: e.T152255A615272. http://dx.doi.org/10.2305/IUCN.UK.2013-1.RLTS.T152255A615272.en. Downloaded on 16 July 2016. 6) Arenas, P. "Etnobotánica : lengua-maskoy". Fundación para la Educación, la Ciencia y la Cultura, Buenos Aires. 1981. 7) Pin, A.B. and Simon, J. "Guía ilustrada de los Cactus del Paraguay". SEAM/GReB, Asunción. 2004. Cultivation and Propagation: Harrisia martinii, (Eriocereus martinii), presents no problems in cultivation and will do well in a sunny spot in a cactus house. Traditional uses: This species is used for food; the fresh mature fruits and the boiled flowers are edible. The Maka natives also ate boiled or roasted roots. The Maka use the thorns to make tatoos. Garden uses: Harrisia martinii, forms long columns that are great for grafting valuable species of cacti and - differently from other common grafting stock - don’t induces plants to elongate out of character and produce weak spination. The scions on Harrisia don’t grow as fast as the ones grafted on other tender and stronger stock, but they prosper very easy and can be kept in dark and cold places in winter. It can easily endure some light frost, too.